For a moment or two, as the boat sped up, I wondered if this had been a bad idea. The rigid, yellow, inflatable hull plowed through the water, throwing up spray on either side. The slightest wave and the bow would rise up alarmingly, only to fall again with a spine-jolting bang. Booking a Yellow Boat for myself and a few friends had seemed like a good idea. 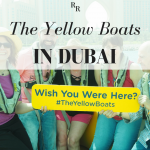 The Yellow Boats leave from a dock in the Dubai Marina and promise views from the sea of the Dubai skyline, the Palm Jumeirah, and other landmarks of Dubai. I had booked the longest tour of 90 minutes so that we would go as far as Dubai’s most famous building, the sail-shaped Burj Al-Arab. 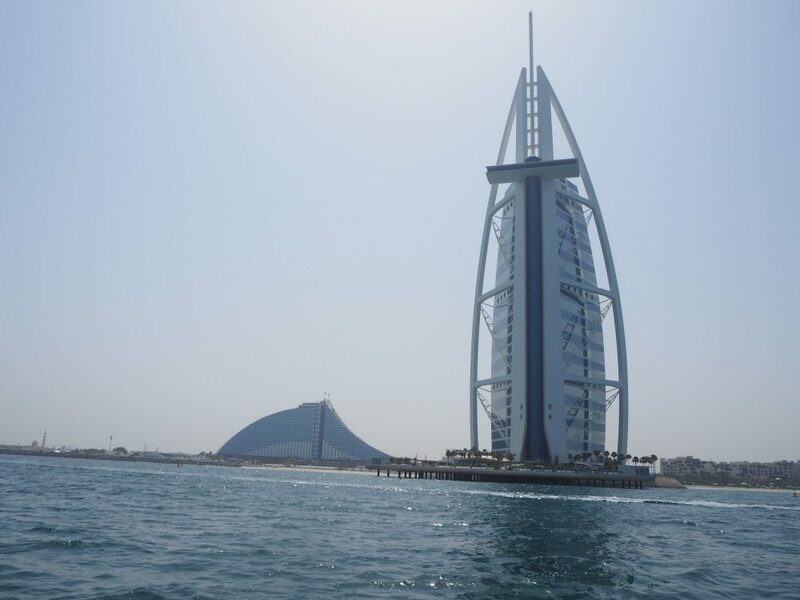 The Burj Al Arab as seen from the water. That interestingly-shaped building behind it is the Jumeirah Beach Hotel. I wore a life vest, and reminded myself that, even if I fell out, I’d be fine. It was warm out, and we weren’t far from shore. The seat was well-cushioned, thank goodness, and I clutched the back of the seat in front of me tightly. Relaxing into the ride, my initial worries turned to pure enjoyment. We flew along, and at times it seemed that the boat left the water entirely, the landings seemed so hard. It was warm out, but the wind cooled us, and we laughed and, occasionally, let out a yell. Our guide/ship’s captain/photographer, Nuwan, started the ride slowly. 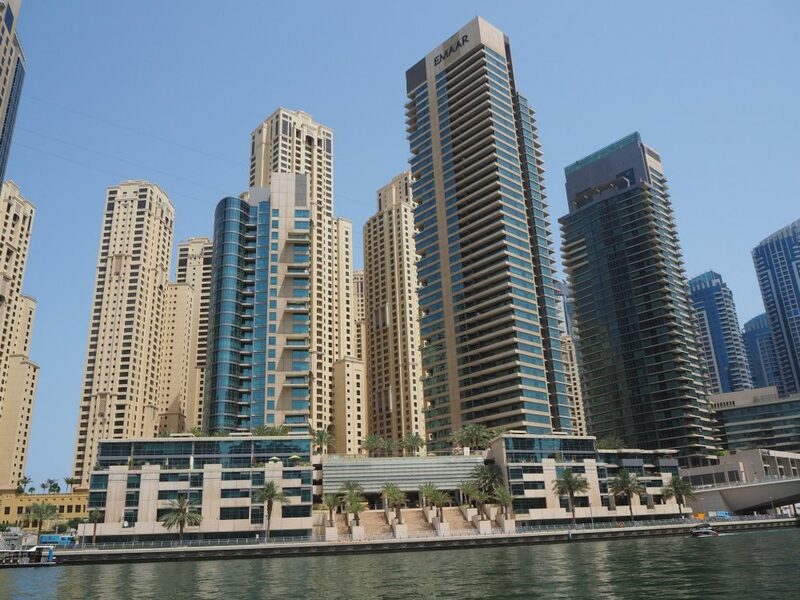 Inside the Dubai Marina, a speed limit kept us at a sedate pace, allowing him to point out landmarks and tell the history of the area. As an entirely new development, much of the Marina’s architecture is attractive and unusual, and Nuwan dotted his commentary with superlatives: tallest, biggest, longest, first. To be honest, Dubai in general seems to revel in superlatives. 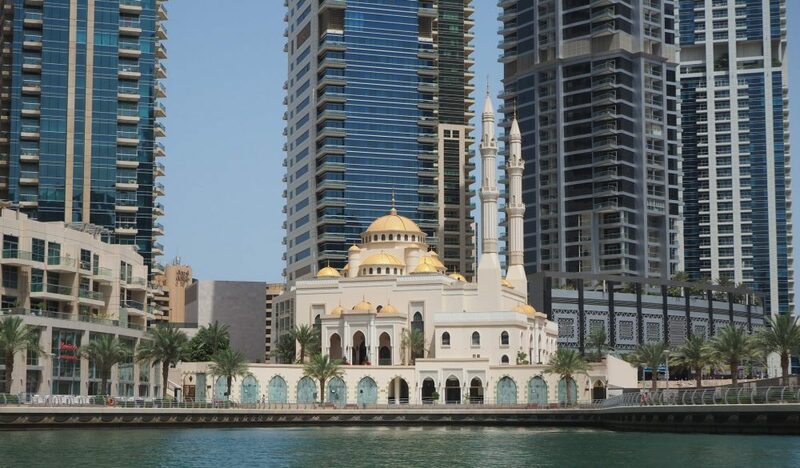 A mosque in the Dubai Marina, surrounded by tall buildings, some finished and some unfinished. When we reached the ocean, though, Nuwan floored it, or at least it felt like he did. Zooming along from sight to sight, he would cut the motor to stop the boat when he wanted to say something, or when we signaled him that we wanted him to stop. He knew all the best picture-taking spots, and good-naturedly took pictures of us as well, sometimes turning the boat again to get the background right. My friends and I at one of our photo stops, in front of the Atlantis the Palm Hotel. For the “room” over the arch, the “royal bridge suite,” 924 square meters, prices start at over 10,000 euros a night. Photo by Nuwan. A Yellow Boat ride is great fun, if you like a thrill and if you don’t get nauseous too easily. The up and down motion is most extreme in the front seats, so don’t take those if you’re concerned. 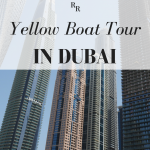 A different company offers a boat tour in Dubai aboard a “luxury yacht” in the same price range; if you’re worried about the speed of the boat, you could try that. I haven’t yet, so I can’t say if it’s any good. Only bring children who are old enough to hold on tight. I assume that the driver would be careful if there were children on board, but I can’t imagine trying to keep a small child safe when the boat is at top speed. The skyline of Dubai was the highlight for me as far as sights go. While Nuwan’s patter about the hotels we saw was interesting, I hadn’t really felt any need to get the perfect photo of any of them, so they were just a bonus for me. 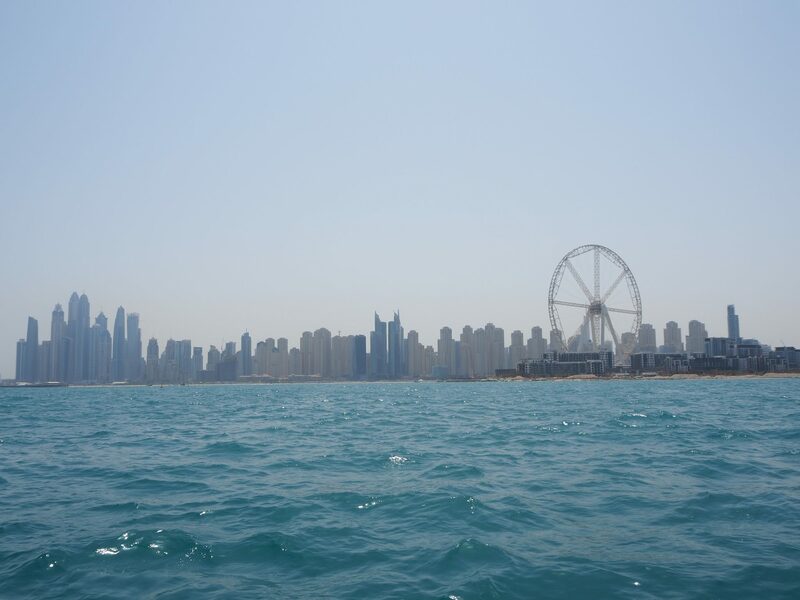 The Dubai skyline as seen from the water. Don’t expect to see Palm Island either, the artificial island group shaped like a palm tree. Or rather, you will see it, but you’d never know if you weren’t told. The 90-minute tour circles around it, but it really just looks like more shoreline filled with new buildings (and a Ferris wheel that Nuwan claimed will be the biggest in the world when it’s finished. It sure didn’t look to us like it was bigger than London’s!). Nuwan did give us a tip though: take the elevator in the Dubai Marriott Harbor Hotel in the Marina to the bar on the top floor, where you’ll be up high enough to get a good view of The Palm. It was closed when we tried, so I have no photos to show whether this is true or not. 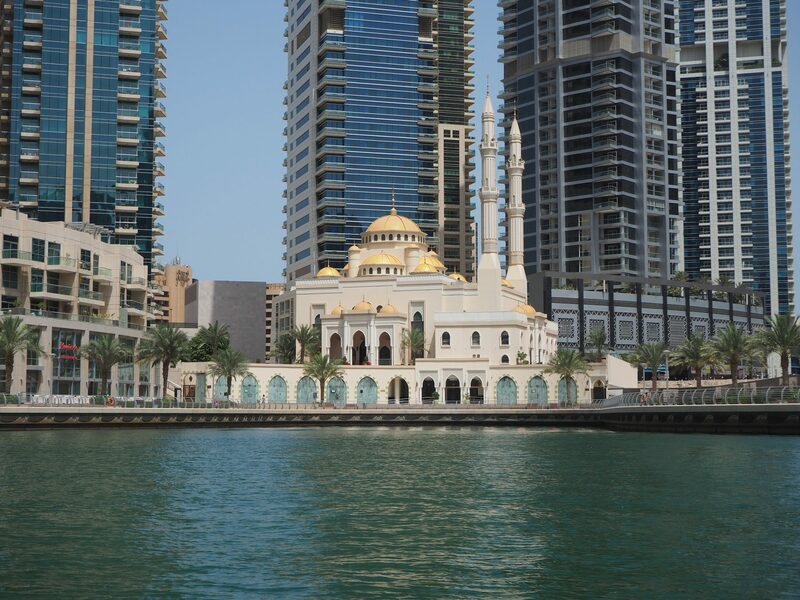 A sampling of the sorts of architecture on view in the Marina on your Dubai boat trip. Tours are available in 60-minute, 75-minute and 90-minute versions, and the boats come in two sizes: 11-passenger, like the one we took, and 14-passenger. In our case, we had seven on our boat besides the driver: our group and a young couple. You can also book a whole boat for a group. 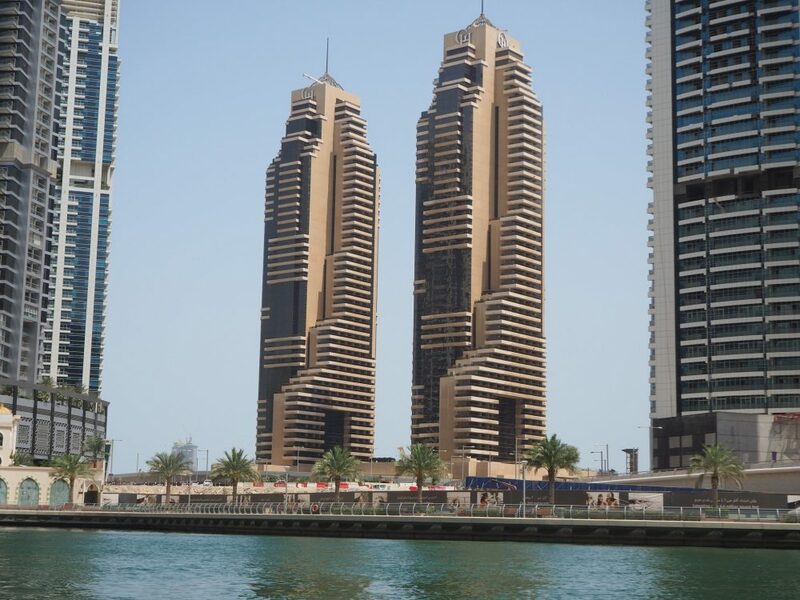 According to Nuwan, these two buildings in the Dubai Marina are meant to resemble ancient Egyptian figures. Do you see it? Regularly-scheduled 90-minute tours go out 10 times a day, starting at 9:00. The 75-minute tours leave six times a day, starting at 9:00. The 60-minute tours stay closer to the city and the sunset. They leave at 18:00, 19:00 and 20:00. 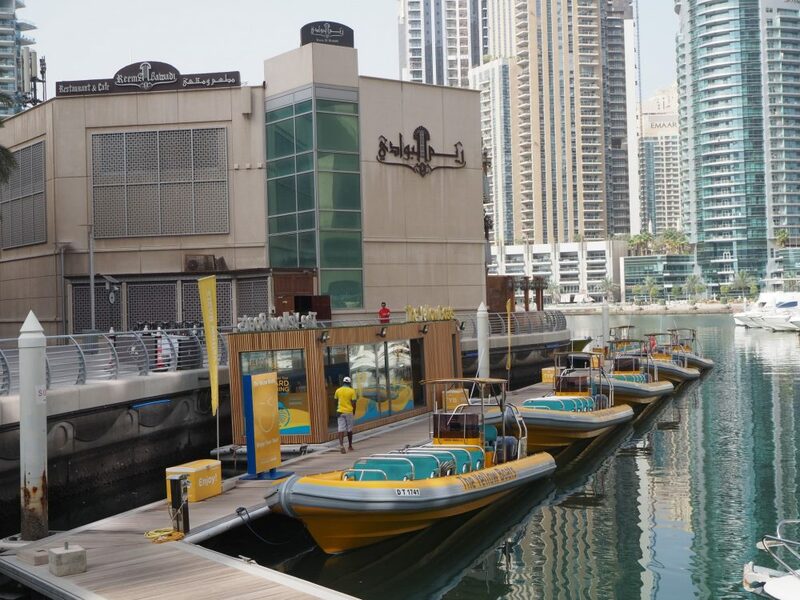 Tours start from Dubai Marina Walk, opposite Spinneys Supermarket and beside Reem Al Bawadi Restaurant, which you can see behind the boats in the first picture in this post. Do you like a speedboat ride like this, or would you prefer a more sedate experience? Add a comment below! And please share this article on social media; the pictures below are perfectly pinnable! What a cool idea to explore Dubai by boat! Though it may not be everyone’s cup of tea, I’d love to explore the city by boat. Looks like the boat ride was worth it from all your great photos. Love the yellow boat sign photo. I’d definitely like to tour Dubai by boat. I am one of the people in the photo, and I can attest to everything Rachel has written here. 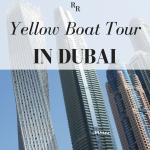 Nuwan was, indeed, a hilarious captain, and, as she wrote here, if you aren’t the sea-sick type, this is a great way to see Dubai from a different angle. Thanks for commenting, David! It was great fun, wasn’t it? 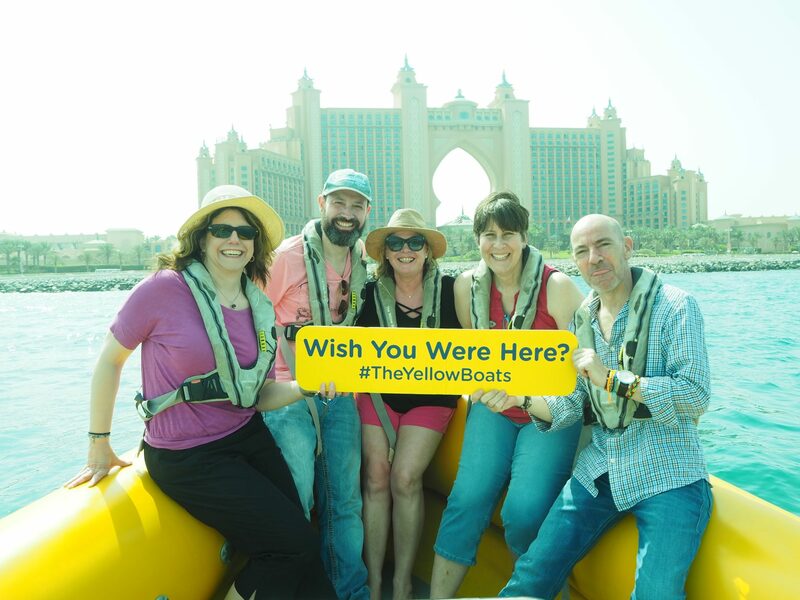 I wish I had known about Yellow Boats when I was in Dubai. What an interesting perspective of the city. I think this is a great architectural viewing opportunity.